Leicester star Riyad Mahrez could play against Posh. Members of Leicester City’s Premier League title-winning squad from the 2015-16 season are set to play in tomorrow’s FA Cup tie against Peterborough United at the ABAX Stadium (January 27). Right-back Danny Simpson and imposing centre-back Robert Huth have returned to fitness and are expected to get a run out in a fourth round tie which will be televised live by BT Sport (12.30pm kick off). Jamie Vardy is expected to be a substitute for Leicester against Posh. Leicester manager Claude Puel is expected to rest most of his bigger names to keep them fresh for a Premier League match at Everton on Wednesday (January 31). Club captain Wes Morgan is a definite absentee because of injury, but the task facing Posh tomorrow is still a formidable one. The virtual reserve XI Leicester fielded in their treplay win over Fleetwood earlier this month cost the club in excess of £100m! Posh have yet to release the results of Jack Marriott's scan. Algerian striker Islam Slimani cost the Foxes an astonishing £29m in August 2016 or over £2.2m for each of his 13 goals for the club. Leicester also paid £25m for Manchester City reserve Iheanacho last summer. He is yet to score a Premier League goal for the club. Star man Riyad Mahrez - a bargain at £560k - started against Fleetwood. Puel said: “We want to try to win both games (against Peterborough & Everton),” he said. “It is important to give some rest to some players for the next game. 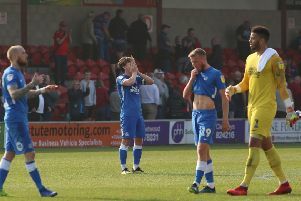 “But we are aware of Peterborough’s strengths. They play good football and they have a striker in form in Jack Marriott and a very talented attacking player in Marcus Maddison. Posh have yet to release the results of Marriott’s scan on the hip injury that kept him out of Tuesday’s (January 23) Checkatrade Trophy defeat at Lincoln.